Every so often, something comes up for Martha Stewart collectors that really gives them cause to consider splurging. The items below are being sold on eBay by a former Connecticut resident who collaborated on a story about holiday desserts in the first issue of Martha Stewart Living magazine. 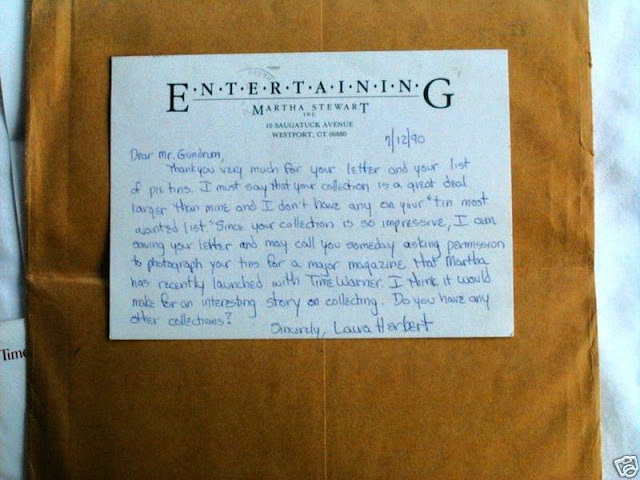 Not only is the first issue part of the sale, but so too is the correspondence between Jerome (the seller) and Martha Stewart Living, which includes a hand-written note from Martha's sister Laura on Martha Stewart stationery, a typed letter signed by Martha as well as the antique cake molds and cake tins that were photographed in the story. Perhaps the piece-de-resistance is a pint of plum chutney that was made by Martha's mother, Martha Kostyra, and given to Jerome by Laura when the cake molds were exchanged at Turkey Hill. "On September 5, 1990, at Laura's request, I delivered my Christmas related cake pans and bake ware to her home in Westport," Jerome writes. "This was late afternoon and Laura and her mother, Martha Kostyra, had just finished making Plum Chutney and they gave me a pint. Yes, of course the house, grounds, and especially the kitchen were beautiful and I've seen them featured in the magazine and on TV." The bidding starts at $900. It's a rather expensive 'martha moment' to be sure, but it's a very unique one! Below are the photos and descriptions of the items. 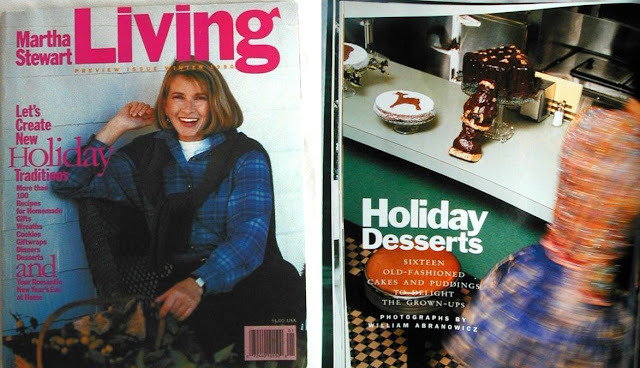 The first issue of Martha Stewart Living (December, 1990) and a look at the introductory page to the "Holiday Desserts" story that features Jerome's antique bakeware in the photographs. Ruldolph the Red Nosed Reindeer and Santa Claus 9 inch diameter tin cake pans. The pans date to the late 1930's. The Santa Claus cake pan is believed to be German. An original Griswold Manufacturing Company cast iron (weighs about 7 pounds) Santa two piece cake mold. What looks like rust in the tree cake pan is actually the grease and flour left in the mold from its use in baking the cake. The cake mold is 12 inches tall and dates from the late 1940's into the early 1950's. A typed letter dated September 19, 1990 saying "We are very grateful for the help you gave us in putting together our Holiday issue. We will, of course, send you a copy of the magazine when it appears, in early November." It is signed by Martha Stewart and is in the original envelope. It also comes with a Martha Stewart Everyday button. The handwritten note from Laura Herbert, Martha's sister, regarding the use of Jerome's bakeware for Martha's 'new' magazine. It is written on Martha Stewart "Entertaining" stationery. 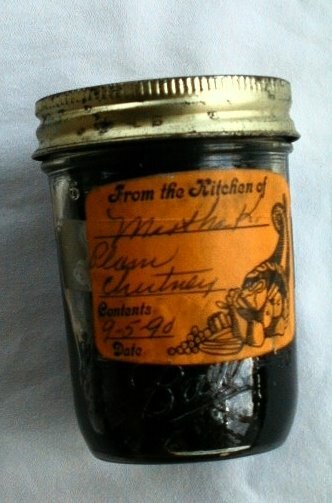 The one-pint jar of plum chutney with a label that notes that it was made by "Martha K." - Martha's mother, Mrs. Kostyra, now deceased. It is dated September 5, 1990. Wow, now that would be the ultimate Christmas present for a Martha fan! Thanks for the interesting tidbit! Wow that is interesting.I would love to have this.I have a lot of the Martha by mail copper cookie cutters.4 years ago I bought a prototype cutter from a Connecticut crafts man.The original star cutter with details on Martha's approval of it for her line.I also once a couple of years ago bid on an auction for her newsletter from her catering days.The seller actually attended a session at turkey hill.They had EVERYTHING from the event.It cost them a little over a thousand for the 2 day event.There were pictures notes ext.The seller pulled the item due to a error in the listing.I begged it off them but they decided not to sell..I scour ebay DAILY for Martha items.When I get a decent camera I will have to email pics of some of my Martha "finds".You should do a post on it sometime..
Joseph, A feature on your Martha treasures is a MUST for this blog! Consider it done. Now, save up and get that camera! I have a feeling I've bid against you often, Joseph! You should leave some stuff for the rest of us. These are interesting items for sure! 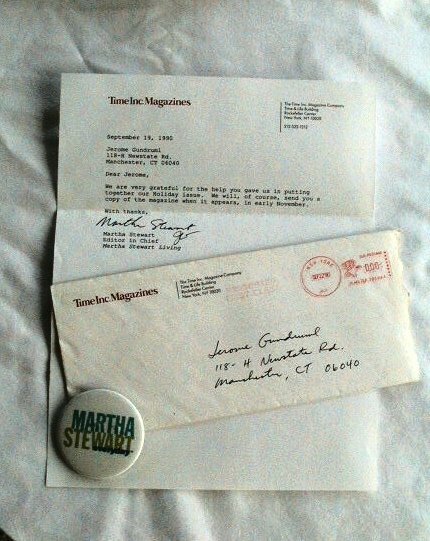 As a Martha collector I would caution about the letter... if you notice, there are initials just below the signature, which indicates that the letter was signed by an assistant or secretary. (a once common business practice) Comparing that signature to several others I have it's close; but no cigar. It's a very nice bundle of collectibles however. I have to agree with your anonymous reader.. I'm sure I've bid against Joseph as well! Yes, Kenn, you're right about the signature. I see the seller has indicated that he was unsure about its validity.